This website is designed for Parents, Students and the Community to find out all there is to know about the Sherwood Music Department. The Sherwood Music Deparment is home to the Repertoire Band, Jazz Band, and the Enrichment Band who all perform at Fall and Spring Music Nights, as well as performing in community concerts, the Hamilton Santa Claus Parade and Music Festivals. For those who are interested in guitar there are both beginner and advanced guitar courses. Piano Keyboard and vocal classes are also offered this year. As well, for students in Grade 7 and 8, the Sherwood Enrichment Band rehearses Monday nights from 6:00-8pm at Sherwood. Feeder school students in the band can earn a high-school credit for playing in this band. Sherwood Music is a very busy place full of strong and dedicated students who are a great credit to both their school and community. To each and every one of these students (and of course their very proud parents! ), congratulations for all your hard work and dedication to help make this one of the strongest music programs we could ever hope for! Parents, please feel free to contact me at any time with any questions or concerns. SHERWOOD MUSIC DEPARTMENT WINS $10,000 CARAS GRANT! 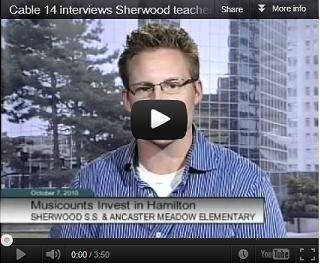 Sherwood was one of over 70 schools across Canada to recieve a $10,000 grant from the Canadian Academy of Recording Arts and Sciences (CARAS). This grant was used to purchase 16 new instruments. The music department would like to thank CARAS for their generous award.